Kleefeld on Comics: On Webcomics: Why So Few Encores? 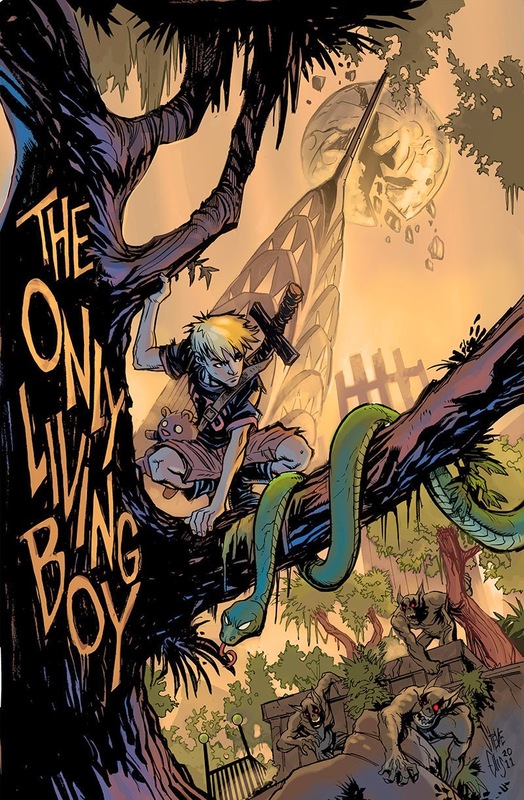 David Gallaher and Steve Ellis recently launched The Only Living Boy as a webcomic. But it's not an entirely new story. It launched as a Kickstarter back in early 2012, and went on comiXology later that year. But what Gallaher and Ellis are doing now is running the story for free online to draw in more readers and generate more interest in the story. It's still pretty early in the webcomic's run, and I haven't talked to either of them about it yet to see if it's working or not, but I think it's good idea. After all, the work's already done, and they've probably made most of what they can get out of the individual issue sales. The pages are definitely not designed for a webcomic format, and I'm sure they would've laid the story out differently if it were originally intended to run online like this, but it still works well enough and it's by far not an unusual format. Plus, they've got the added benefit of being able to tell people, "Hey, if you like it well enough here, think of how much better it will read as a printed comic!" Now, Gallaher and Ellis can obviously do this since they own the story and all the characters. Any creators working for Marvel or DC wouldn't be able to. But how many other creators out there could do this? How many guys tried their hand at an independent book back in the 1980s, only to have it flop because there was a huge glut of indie comics coming out at the same time?Or underground artists in the '70s? Or even some of the more recent (say, post-2000) independent books that have come out? With very few exceptions, these are stories people aren't really looking for. And what they are finding is in a secondary market, so the original creators aren't getting money from their books. When was the last time, do you suppose, there was a demand for a new printing of Shatter or Maze Agency or Lost Planet? There was some good stuff there, but I don't think any of them lit up the sales charts. But couldn't they run these as webcomics? The stories are still valid enough. The biggest hurdle, I'm sure, would be getting all the original art and formatting it for the web. I don't doubt a lot of originals have been lost to time, and many of those would've been made in a time when having them scanned into the computer just wouldn't have been done, so they'd have to all be done. So, yeah, there'd be some work involved under even the best circumstances but not so much as to make it infeasible. So what's the upside? Renewed interest in the story primarily. But what that renewed interest can come two things: demand for a new printing or trade collection, and/or a continuation from the original. Both of these are basically income generators. Maybe not huge (unless, of course, it happens to catch on virally or something) but it'd be more than nothing, which is what those stories are making currently. Seems pretty obvious to me, but I've only seen a very few people try this. Why aren't more? We saw the tremendous power of High Moon and its potential to reach millions of readers over the course of three years and wanted to follow suit. Publishing the series as a webcomic (with paid sponsors, no less) gives us an opportunity to broadcast our series to more readers. Our model is most similar to ad-supported broadcast television. Want to read the comic? Tune in every Monday/Wednesday/Friday. Want to get it digitally? You can buy a digital copy through comixology. Want a print copy? Flag us down at a con -- or talk to your local area comic shop. It's not dissimilar to the broadcast to digital download to DVD box set model that you see major studios using. With the push of a button we have immediate access to metrics that we wouldn't have working with other parties or partners. This access to metrics allows us to determine what our thresholds for success are and plan/grow accordingly. To respond to your question, Sean, it's better than nothing, but it's not without cost, either, in time if not money (hosting, scanning, etc.). I'd like to see some favorites return, but with so much more competition these days, it might be also a fear of being discouraged if something doesn't hit big.